ONE OF Alex Salmond’s key economic advisors has rejected the prospect of slashing tax for big firms – a flagship SNP proposal after independence. Nobel Laureate Professor Joseph Stiglitz has warned that cutting corporation tax is a “gift” to multinationals like Google and Amazon and will “increase inequality”, it emerged today. 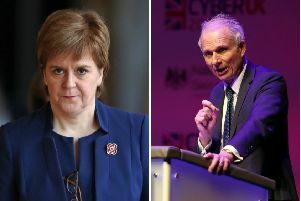 The comments came to light as the First Minister was attacked at Holyrood today over his plans to cut corporation tax levels in Scotland 3 per cent below the UK level after independence. Mr Salmond insists it would attract major companies to locate in Scotland, creating thousands of jobs and boosting growth. But Labour leader Johann Lamont insisted that it would make Scotland a tax haven for multi-national firms. Professor Stiglitz is part of the Scottish Government’s Fiscal Commission working group which is helping draw up a framework for Scotland’s economy post-independence. Ms Lamont today told MSPs that the First Minister likes to remind them of “all the Nobel prizes” Professor Stiglitz has won. “What does Joseph Stiglitz think of this policy?” she asked. “Well just a month ago he said `Some of you have been told that lowering tax rates on corporations will lead to more investment. The Labour leader insisted that the policy would leave Mr Salmond “deeper in the pockets of corporate greed” than Chancellor George Osborne. But Mr Salmond insisted that the Scottish Government had carried out modelling on a 3 per cent cut in corporation tax below the prevailing UK rate. “The results of that show an additional, over the medium term, 27,000 jobs and an increase in Scottish GDP of over 1 per cent. “I think the policy of this government should be, when it controls corporation tax, to set a competitive rate and then collect the corporation tax. Mr Salmond added that Professor Stglitz had also pointed out that “vast disparities” in income levels in the UK under the last Labour Government was not an efficient way to run an economy and that the academic also supports SNP plans to keep the pound after independence through a “sterling zone” currency union. “I’m delighted that Johann Lamont is now going to accept the wisdom of Joseph Stiglitz,” Mr Salmond said.